A board of chess players? Chess has been solved, apparently. Does Tournament Theory apply to chess? Good at maths == Good at chess? The 2014 International Conference Chess in Schools (ICCS) was held in Armenia a couple of weeks ago. As in any good academic conference there was a mixture of speeches, social activities, but most importantly, paper presentations. The main topic was chess in the educational system, covering both the practical aspects, as well as assessing the benefits of chess in the classroom. The conference papers and presentations are available from the conference website. Most of the papers are short enough to be easily digestible, so if you are involved in mainstream classroom teaching, it may provide a new source of information to assist you in your work.And if you aren't teaching chess in class (but want to), it may provide supporting evidence for you request to the school principal for chess classes during school hours. While idly chatting away at a chess coaching class, the topic of collective nouns came up (as it does from time to time). It occurred to me that I was not aware of a collective noun for chess players, or if I was, I had forgotten it. My initial suggestion was a 'set' of chess players, an obvious reference to a chess set. Looking online I found at least one reference to a 'board' of chess players. This can be taken to refer to either the chess board, or a group similar to a board of management. Unkind souls may even use an alternative spelling and describe the group as 'a bored of chess players'. The same source also mentions a 'brood' of chess players, but I find this less appealing. Nonetheless, I find both choices unimaginative, but at the same time cannot think of anything better than my initial suggestion. Possibly an 'asylum' of chess players might work, but this may be more suited to a private joke than public presentation. Despite some very sketchy chess, I managed to finish equal first in the latest tournament at Belconnen Chess Club. I won a few lucky games, lost one pretty horrible effort, and had some last round results go my way. Finding a game worth showing was difficult, as they all seem to have their flaws, but in the end I picked my win from last week. 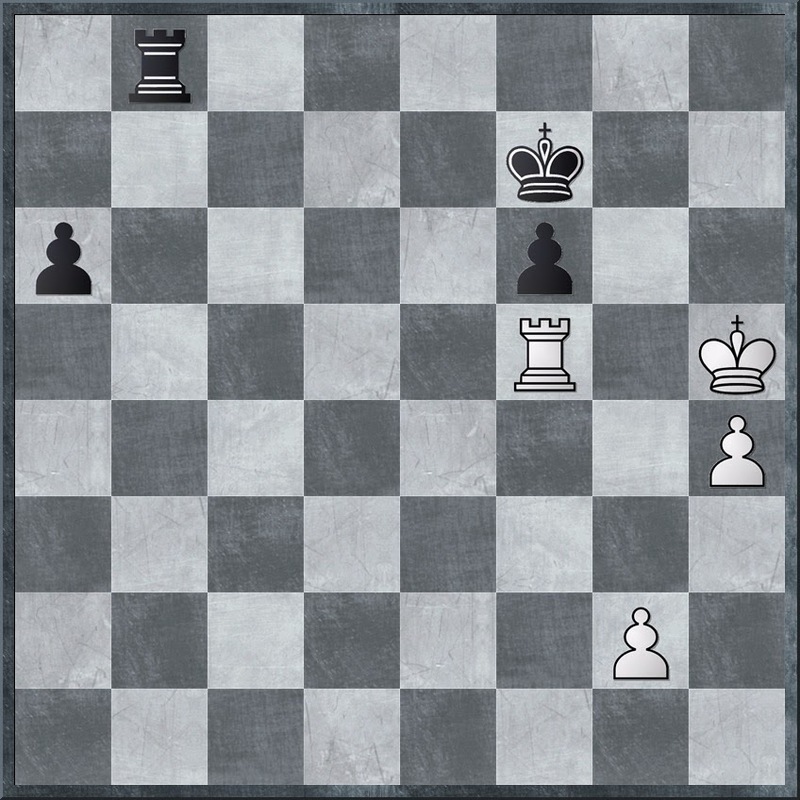 I missed a clear win on move 21, and at one point after that my opponent was even better. But a combination of luck and the randomness of the position meant I was able to regain the advantage and eventually win the game. "Person invents improved version of chess" is a familiar and yet somehow boring headline that I see quite often these days. The latest version that this headline has been applied to is XYQ4, which seems to deal with the issue of reliance on learning and memory by making everything random. But what is truly special about this version it that it seems to have been built on an entire erroneous basis. In this article the games creator, Damien Sommer, thinks chess is broken because "Chess is either a draw or White wins. There is no situation where Black wins". Now this claim fails on both a practical level, where Black wins quite a number of chess games that I have witnessed, and on a theoretical one. No such proof exists of the outcome of a perfectly game of chess, and for Sommer (or the reporter) to make a claim like this is difficult to understand. This is even pointed out in the comments to the liked article! I was recently pointed in the direction of an area of Economics called "Tournament Theory" (thx Leron Kwong). It is a theory in personnel economics (human resource management) that tries to explain that rewards (pay and compensation) is not based on additional productivity, but on the relative difference between individuals. The situations it tries to explain do appear in chess, but I wonder if this is coincidental. For example, normally tournaments are structured so that 1st prize is significantly larger than 2nd prize (normally twice as much). But the winner of a tournament is not normally twice as good as the player that came second. So the reason for the difference is not based on performance, but on tournament ranking. This also occurs on the field of business, where the President of a company earns a great deal more than Vice-Presidents. As this theory was only first proposed in the early 1980's, chess practice clearly pre-dates it. I assume that the method of dividing up prizes in a chess tournaments probably arose through trial and error, before a model that the majority of players seemed happy with was developed. Nonetheless, there may be some ideas that chess could use. I have seen events where 1st prize greatly exceeds the other prizes (1st $1000, 2nd $100), and this seems to have skewed the performance of the top players. Given that one of the goals of tournament theory is to maximise the effort of the tournament participants, it may turn out that there is a theoretical "better way" to divide up prize money in events. As I get older I am suffering the affliction of increased confusion, especially at chess. It is particularly noticeable when I am faced with a position with lots of scattered pieces on the board. I had an example today where I was material up , but my opponent had knights, bishops and rooks scattered around the board. Trying to keep track of all the threats turned out to be quite difficult, and I felt fortunate to eventually swap enough pieces off and win the ending. The position on the right is much more to my liking. While there are plenty of bits on the board, they are all focused on a very narrow set of targets. White is trying to queen a pawn, Black is trying to stop this, and so the play is pretty direct. Of course calculation is required (and quite deep calculation), but it is of a specific type. For some, the prevalence of computers is the scourge of Correspondence Chess. A large number of OTB (over the board) players cite it as a reason that they do not play CC, reasoning that they can just as easily play against a computer at home. Even arguments that not all players use chess engines in CC are often met with sceptical looks. Curiously there is a smaller group of OTB players who do not play CCLA events (which prohibits engines in postal events) on the grounds that it is unfair to hold them to a rule that they are sure their opponents will ignore. However there is a series of CCLA events which does attempt to address this issue. The CCLA Bicycle events (because no engines are used!) have been running for the last 2 years, organised by Brian Jones. They now start monthly, and are restricted to players rated under 2000. The reason for the rating restriction is both to keep the events accessible to the majority of players, and to stress that the competitions are not for sheep stations. Generally the events have worked well (apart from the ongoing issue of 'silent' withdrawers) and I have noticed a number of familiar OTB names popping up. Of course CC can be time consuming but I find 1 event at a time (6 games) is manageable. If you are interested in playing in such an event, just visit the CCLA webpage, and contact Brian Jones via the 'Contact Form' menu option. One of the side effects of the recent "Millionaire Chess" even in Las Vegas, is a greater focus on how the game can be presented. Chess is still hoping to emulate the TV Poker boom of the last decade, and the use of numbers may be the way to do it. GM Maurice Ashley is working on a system called Deepview, which collects a larrge data set from the games of the worlds top players, and then uses that information to provide the viewer with a perspective on the game. Unlike the current system of just using a chess engine to state who is winning, Deepview also looks at the players relative abilities in openings and endings, as well as how they fair in quiet or tactical positions. While this idea is not necessarily new (I even read articles about chess statistics from the 1950's), the era of 'big data' provides the technology to make it happen. Even if it doesn't succeed in capturing the broader market of sports enthusiasts such a system would still be a great addition to the current online chess coverage. R+BvR is a rare but tricky ending that most players know about, but don't know enough about it. It turns up just often enough that I suspect it should be memorised (especially the defences). 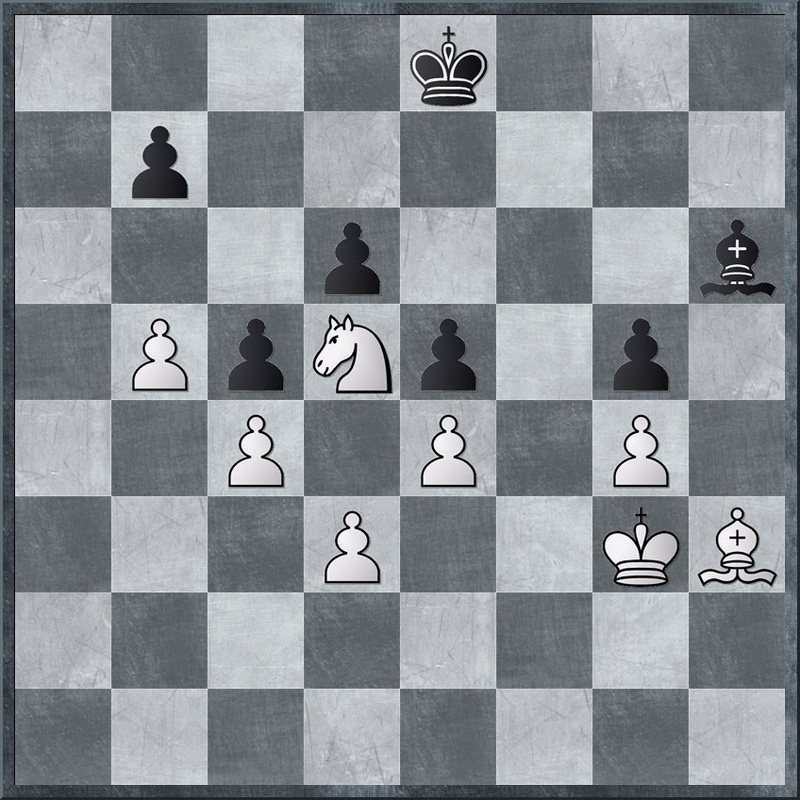 An example of this occurred at the ANU Chess Club tonight, when the following position was reached. After much shuffling around (on a 10 second increment mind you), White was unable to find the winning idea and a draw was eventually reached. After the game I thought that the position shown was a winning one, but could not remember the exact technique for converting it. I had a vague recollection that the Black rook needed to be on the third rank, so the bishop could deny it access to a key defensive file. 1. Ra7 Rd1 2.Rg7 Rf1 3.Bg3! (The key idea in this ending) 3. ... Rf3 4.Bd6 Re3+ 5.Be5 Rf3 (For now it looks like nothing has changed, but both the c and g files are now denied to the Black rook) 6.Re7+ Kf8 7.Rb7 Kg8 8.Rg7+ Kf8 9.Rg4! Re3 (To prevent Bd6+) 10.Rh4 and the Black rook cannot defend with Rg3. The 2014-15 FIDE Grand Prix series has got off to a compressed start, with the Tashkent GP starting almost as soon as the Baku GP event had finished. While there has been a slight change to the lineup (players in the series play 3 of the 4 events) both winners from Baku, Fabiano Caruana and Boris Gelfand have backed up for this tournament. The whole event began this evening (Canberra time). Of the 6 round 1 games, 5 are still in progress as I write this, with Giri and Gelfand drawing in 39 moves. Curiously the website has Caruana playing under the USA flag, which is either late breaking news, or just a simple mistake. If you want to stay up late and follow the action the website, with the usual live games plus commentary is here. I had a quick look at the chess-db website, and it seems that they have added some new features. Chess-db is basically a huge online chess database with some bells and whistles thrown in. One such whistle is an 'Explore Blunder' option where you can be shown some of the worst blunders in a players career. I clicked on the link for my own games, and while the list is restricted to 4, it is a pretty horrible 4. In fact a couple of them are so bad that I am struggling to remember where they happened, but I'm pretty sure a few cam from some sub standard Olympiad performances. The other feature I am going to test is the 'Play Chess against X' where a computer engine is supposed to play in the style of Player X, as determined by the analysis of their games. If it truly emulates the style of my game I expect to be hacked for a bit, and if the attack fails, hang on to win after a series of mistakes. The trend for computer games is for them to be purchased online. While this is convenient to the user (except for those with limited download capacity) it is making the traditional game store obsolete. The biggest online store is probably Steam, and purchase a lot of games from there (including a number I have never actually played). While they have lots of first person shooters etc, they don'y have a lot of chess programs. Of course dedicated chess programs are a bit of a niche product, but the number one chess program on there is Fritz 14. This is followed by some familiar titles like Battlechess, while the chess variant Chess 2, features prominently. Below that are what I would either call chess-like or chess-inspired games. Khet 2.0 is one example, while the venerable Archon still seems to be around. After that it is a bit of a mixed bag, where the game may be inspired by chess (eg it is a turned based strategy game) but after that it is anything goes. As a source for games Steam is usually a little cheaper than the non-downloaded versions so if you are looking to stretch your dollar, it may be a sensible place to shop. From the 'Lawyers will argue anything if paid enough' file comes a court case from India concerning duty paid on games. In this specific case Funskool India is trying to avoid paying 17% duty on miniature chess sets by having chess classified as a puzzle, rather than a competitive game. A previous determination stated that a product is only a puzzle if the outcome is predetermined. Clearly this does not apply to chess (as yet), although they may try and get away with this argument in regards to draughts, which is at least a draw with best play. I doubt they will succeed in their appeal, although in a lot of cases of this sort, I am never sure whether it is the facts, or the law as written which is the most important factor. Having attended the start of the 2014 ICCF Congress, I made the trip back to Sydney to attend the closing banquet. A quick discussion with various ICCF delegates indicates that International Correspondence Chess is doing OK, and the ICCF is doing quite well as an organisation. The congress itself was both constructive and without rancor, although the fact it was a non election year may have helped. At the closing dinner there were a few speeches, but what really pleased me were the number of delegates who congratulated the CCLA on how we organised the congress. Thanks for this must mainly go to Brian Jones, and the extended Jones family, for putting in an enormous amount of work. Apart from the congress there were some chess activities as well. IM Gary Lane won the traditional blitz event with 8/9, while the ICCF team defeated a Western Sydney team 6.5-2.5 in an over the board match. Sometimes I am happy to play short, sharp games, even if they end in a draw. Of course I am happier to play them when my opponent is rated higher than me, as in the following game. 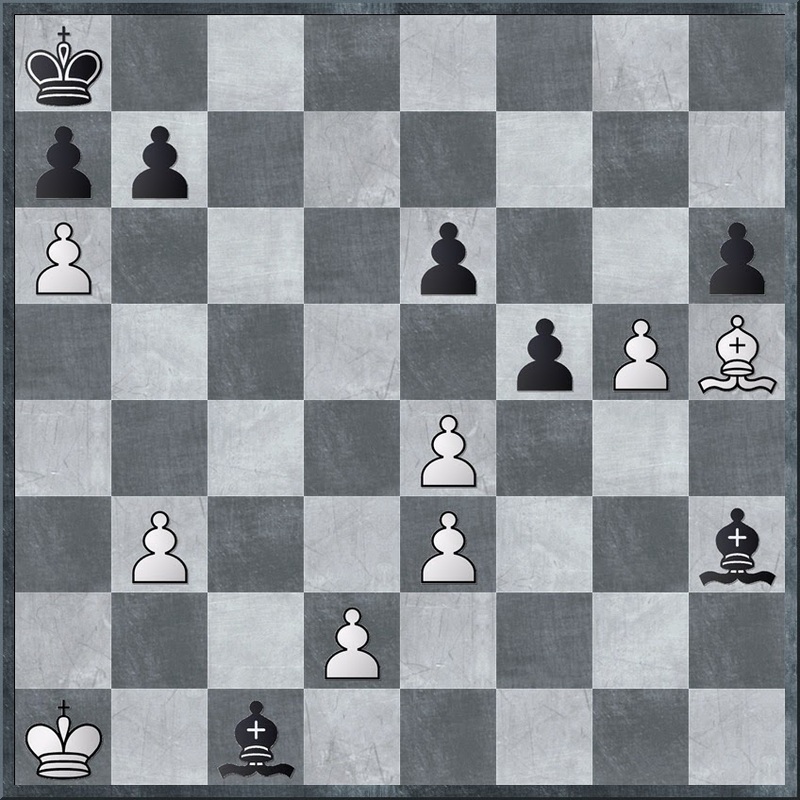 As with my recent games there were things I played on a whim (12.f5), things I just did not see (17. ... Ne5) and things I had to find out of desperation (18.Qa4). In the final position I was probably a little better, but having avoided the worst of it on move 18 I decided half a point was a decent reward. The title of this post popped up in an article I stumbled across this evening (NB I have rephrased the original comment). The article concerns game theory, which I enjoy, and is about why mathematicians play games. The statement was presented without any real supporting evidence (well, none really), but is one of those things that non chessplayers may believe is true. While I do know some mathematicians who are good at chess (to the IM level), I know a whole lot more who aren't. In my experience, I am much more confident in stating that being good at chess helps you to be good at maths, rather than the other way round. But the point of this post isn't to rip into the article and the writer. The article itself is quite interesting, and is the website I found it on. It came from an online magazine called +Plus, which presents interesting articles about mathematics. Apart for the above article there are plenty of other topics covered, and if you are interested in 'recreational' maths, then I recommend it highly. It is a bit of a surprise to me that the question of the 'best' chess painting is a topic that does not come up to often. Having a look around the net I saw the odd discussion, but no one offering a definitive list. Of course one of the issues is how you define a 'chess' painting. My general definition would be any picture with a chess board, game or even a piece in it, but a stricter definition might require chess to be a central theme or motif in the picture. 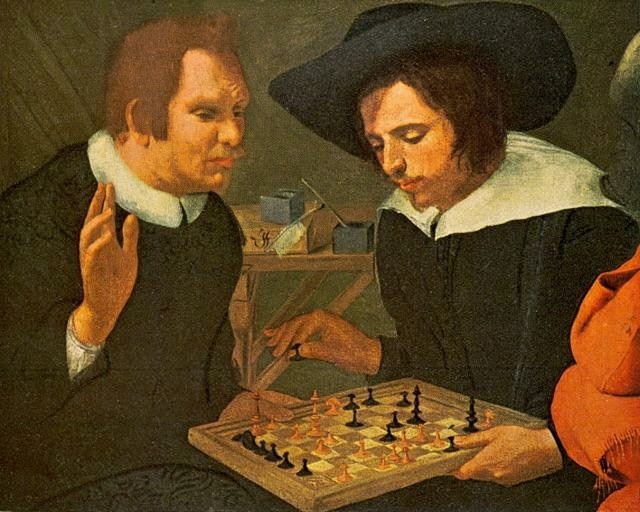 One picture I cam across which meets the latter definition is "Ben Jonson and William Shakespeare playing chess" by Karel van Mander. There appears to be a degree of academic debate about what the painting represents, with the consensus being it is symbolic of the rivalry between the two playwrights. So while this picture may not be the 'best' in terms of ascetics or fame , both the style (which I like), and the subject matter still make it a standout for me. The 2014 ICCF Congress started today, at the Parramatta Park Royal in Sydney. The congress started with a meeting f the ICCF Executive Board today, while the actual Congress starts tomorrow. The delegates, who had traveled from Europe, North America, Africa and India, were welcomed with a small function at the tournament venue. The formal welcome will be at the opening dinner tomorrow. In terms of the business of the congress, it is mainly to do with what can be described as 'technical issues'. Unlike a FIDE Congress, the deliberative body is both small enough, and more engaged, so as to allow discussion of changes to things like Laws, Title Regulations, and Tournament rules on the floor of the congress. Probably the big issue, at least in terms of the ICCF Laws of Chess, is how closely they need to match the FIDE Laws of Chess. Clearly there are some differences (eg touch move!) but there is a recognition that the second C in CC does stand for Chess, as defined by FIDE. I will be present at the congress tomorrow, although I have to miss the following days.But unlike the FIDE congress I am pretty confident that the important work will be done pretty quickly and most of the contentious issues will be out of the way early. Continuing my recent look at endings, I present the following nice position from 1911. In this case Tarrasch got one over his rival Nimzowitsch by knowing exactly when to swap into a apawnending, and then knowing what to do after that. It is also an example of what I regard as 'playing by knowing'. I'm assuming that Tarrasch worked out the winning line over the board, but for the rest of use, it is now enough that we can remember the example to use it in our own games. Of course this assumes that there is enough spare room in our heads to store such items, but 'knowing' this idea is probably preferable to having to work it out. In the game Tarrasch (as black) finished off Nimzowitsch with 1. ... Rb5 2.Kg4 (to get back to the a file asap) Rxg5 3.Kxg5 a5 4.Ke4 f5+!! (The winning idea. If 5.Kxf5 then the a pawn queens) 5.Kd4 f4! Now White cannot play g3. While the White king is dealing with the a pawn, Black can play Kg6-h5xh4 and wins. The f pawn had to reach f4 to stop White protecting the h pawn with g3. The diagrammed position came from a game at the ANU Chess Club last Wednesday night. The material imbalance cam about bt Black sacrificing a bishop in the hope of setting up some sort of barrier across the centre of the pawns. The alternative had been to lose all the queenside pawns to a marauding rook, which didn't appeal to black at all. Unfortunately for Black this inventive idea had one weakness, the a5 square. As long as Black could not safely play b6, the White king can march across the board and either come in on b6 or play b6 himself, and lay siege to the b pawn. 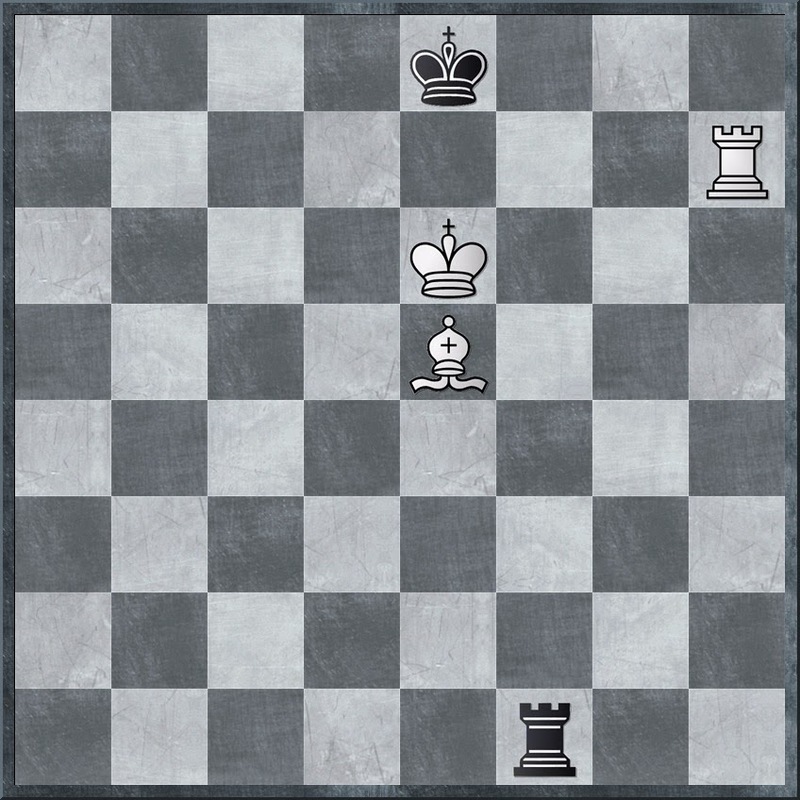 This is in fact what happened, although the winning plan did take around 20 moves to be completed, but even at 10 seconds a move, it was easy to play. For most of the time the Black king shuffled between a8 and b8 before a well timed Bc6 (with the White knight on a5, the Black king on b8 and the Black bishop on e7, brought the game to its inevitable conclusion. The gap between Fabiano Caruana and World Champion Magnus Carlsen continues to shrink, with Caruana picking up more rating points at the FIDE Grand Prix event in Baku. After 6 rounds Caruana leads with 4.5 (+3=3), half a point ahead of Boris Gelfand. Caruana has defeated Karjakin, Mamedyarov and Andreikin Svidler, to contiue his fantastic recent run of results. His win over Mamedyarov came about through good defence, after Mamedyarov staked everything on a sacrificial attack. Unfortunately sacrifices and wishes are not enough to win games like these, something that many a club player can attest to! **Correction: I had Caruana beating Andreikin in the initial version of this post, when it should have been Svidler. It seems I have cursed Caruana as a result, as he has lost to Andreikin in last nights round. In certain chess events (Olympiads, Candidates matches etc) you will be forfeited if you are not at the board at the official starting time. The oft cited reason is that chess should be like other professional sports, and they manage to start on time. Of course this claim does not always stand up to closer scrutiny, and an incident from the 2014 National Rugby League Grand Final in Australia shows this. South Sydney had not won (or even played) a Grand Final for 43 years, and there opponents, the Canterbury Bulldogs decided to try an exploit that. While the South Sydney team ran out on the field at the correct time, Canterbury waited for 5 minutes before emerging from the dressing rooms, hoping that the extra wait would throw South's off their game. It turned out that it did not work and South's scored an emphatic victory. Roy Masters (who knows a thing or two about chess*) reports on the incident. The take away quote is "they can't start without us". Of course if this was a chess event, there may not have been a match played at all, and South's could have taken the trophy home a couple of hours earlier. *He once described two star wingers as being "like bishops of opposite colours" as they never came into direct contact during a game he was reporting on. The 2014 World Junior Championship has started in Pune, India. It has attracted a large and strong field, with 18 GM's in the 137 player field. The Girls event has 78 players, with 4 WGM's in the field. Surprisingly Australia has no representatives in either event, although this may be due to the proximity to the World Youth Championships, which were recently held in South Africa. Indeed for a lot of countries, the World Youth seems to have supplanted the World Junior as tournament to play in, although I am not entirely sure why. I would think that the idea of getting your best junior player to the World Junior would still be a goal for most federations, although this may be dependant upon funding. The second round of the tournament was played today, and live games can be found on the official website. I did notice on curiosity on the top board, with the Ider - Wei game lasting only 4 moves. At first I thought it may have been a mobile phone loss, but rechecking the game showed an additional 8 moves had been played. I'm now assuming there may be some issues with the dgt board, and that eventually the whole game will be revealed. The much vaunted Millionaire Chess tournament in Las Vegas is just a couple of days away. When launched the major question would be whether the big prize money would attract players to pay the sizeable entry fee. As an experienced tournament organiser it always seems that there is never quite enough players entering any event to cover the prize fund, and I think this is the case for this event. At the time of writing this there were 525 entries across all the events, which seems to leave the organisers a little short of covering the full $1,000,000 prize pool. However the event is still taking entries at $1500 a pop ($2000 on the day), and players can restart events with a $400 re-entry fee, so their is a chance that the shortfall will be reduced. The other point of interest is how such a big cash event is going to operate in practice. It is fair to say that USCF have some unique features and I suspect the organisers may have their hands full. The temptation to try and gain an extra advantage (through various means) is certainly a large one, and the arbiting team clearly needs to be extra vigilant. The whole thing begins on Thursday 9 October, and more information can be found at the tournament website. I probably keep a weather eye on the tournament (for a couple of reasons), and it will be interesting to see if it proves successful enough to make this an ongoing thing. I fear I have become obsessed with playing 'perfect' chess. Even when I win I still worry that this due to my opponents mistakes, rather than because of my own good moves. The two main causes of this are (a) the advent of computer analysis, where every move is judged in terms of centi-pawns and (b) studying classic games where the winning plan seems to run for 30 moves and is executed flawlessly. Of course reason (a) tends to strike a blow not to just my games, but a lot of games covered by reason (b). However we tend to me more forgiving of the mistakes of other, than of our own (at least privately). Nonetheless I've decided to feature a 'classic' game, where Aaron Nimzowitsch seems to win without too much effort. Reinfeld and Chernev labelled it a 'positional masterpiece', but Fritz just thinks Black blundered on move 7. But you can only play the position your opponent gives you, and it is still quite instructive to see Nimzowitsh take control of the position all the way to the end of the game. Most, if not all, chess players are aware of the Knight Tour. For non chessplayers, it is a challenge where you have to visit every square on the chessboard once and only once with a knight (moving legally of course). The first solutions to this problem probably date back the the 9th century, and since then various approaches to solving the problem have been developed. Obviously one trick is to simply memorise the sequence of squares for a re-entrant tour (where the finish square is a knights move away from the start square) as you can then start on any square on the board and still have a solution. However if you want to solve it for yourself, Warnsdorff's algorithm might be helpful Basically you move the knight to a square with the fewest squares to move to (although when I tried this I trapped the knight!). There is a substantial amount of mathematical research on this topic, dating back to Euler. It is also related to various mathematical 'colouring' problems, as the knight must always move to a square of the opposite colour it stands on (a fact which leads to a quick answer to the question of the maximum number of knghts on a chess board where they don't attack each other). Wikipedia has a page devoted to the Knights Tour, including information on tours of non 8x8 boards. I also came across a discussion of the Knights Tour in the book "Mathematical Conversations" where is has a number of problems associated with it. Here are two simple ones which I think can be solved with a little bit of thought, and the information in this blog. (A) Take away the h file and the 8th rank from a normal chess board, leaving a 7x7 board. Why can't a knight perform a knights tour on this board, if it starts on a white square? (B) Using the same board, can a knight end its tour on square adjacent to it starting square (orthogonal, not diagonal)? While the world of Correspondence Chess (CC) is a bit arcane for most of the younger generation it still forms an important part of the overall chess fabric. CC is a particularly important part of Australian chess history, as the 1st CC World Champion was CJS Purdy, one of this countries most significant chess personalities. As part of the celebrations of the 85th anniversary of the founding of the Correspondence Chess League of Australia, the International Correspondence Chess Federation (ICCF) is holding its 2014 Congress in Parramatta in a weeks time. The congress runs from the 11th -18th of October, at the Parramatta Park Royal. At this stage around 30 delegates from across the world will be attending, and while it is smaller than the recent FIDE Congress in Norway, I am sure it will be both less fractious, and better run. If you are interested in finding out more about the event you can visit the Congress website. As part of the congress there will be a couple of chess events (OTB!) with a blitz tournament on the 15th, and a match between the ICCF and Sydney on the 16th. Spectators to these events are more than welcome. If you are interested in finding out about the Australia CC scene, you can visit the CCLA website. These days most CC is played by webserver, and the CCLA has just announced various championship events for 2015. New, or resurrected events for next year include a Women's Championship and a Junior (Under 21) Championship. If you were a chess piece, and wanted to maximise your chances of survival (ie remaining on the board throughout the game), which piece would you be? The obvious choice is to be a King, as they never get captured, but could you live with the fact that everyone was out to get you. Otherwise, which piece (or pawn) would you be? It turns out Oliver Brennan has already answered that question, with some programming and a big database of games. It turns out you should choose to be the h2 pawn (White's King's Rook Pawn) as you survive 73.9% of all games played. Of the big pieces, the rook and h1 escapes 55.6% of the time, but any rook is almost as good,as they all survive more than 54% of the games. What you want to avoid is being picked for the role of White's d pawn. You get in the neck 75% of the time, although any of the knights have a similar mortality rate. If you want to see the results for all the pieces, including a pretty diagram of the data then check out Oliver's answer to this question on Quora. Despite concerns it would not be happening, the 2014-15 FIDE Grand Prix is almost up and running. The first event of the 4 tournament series begins today in Baku, Azerbaijan, with play in the 12 player round robin beginning tomorrow. The field is headed World No 2 Fabiano Caruana, with Grischuk, Karjakin and Nakamura some of the other big names. The tournament runs until the 15th of October, and is the first in a series that includes events in Tehran, Tashkent and Khanty-Mansisyk. The tournament web site is here, and games start at the rather pleasant time (for Canberra) of 8pm in the evening.